Lighten up the hallmark leftover chicken dish with this NO MAYO chicken salad bowl! 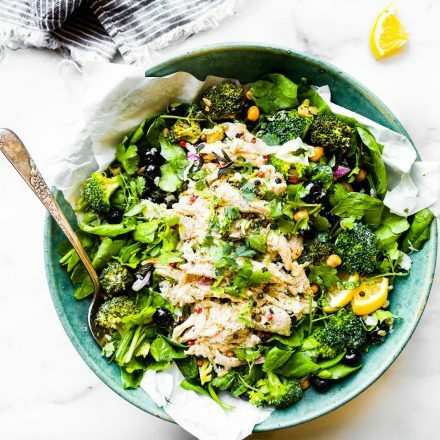 Everyone likes chicken salad different ways, so swap out some heavier ingredients and add a little superfood to lighten it up. Yup! A family style superfood salad bowl packed with protein, real yogurt dressing, broccoli, spinach, chickpeas, goji berries, and more! Well, here we go again! 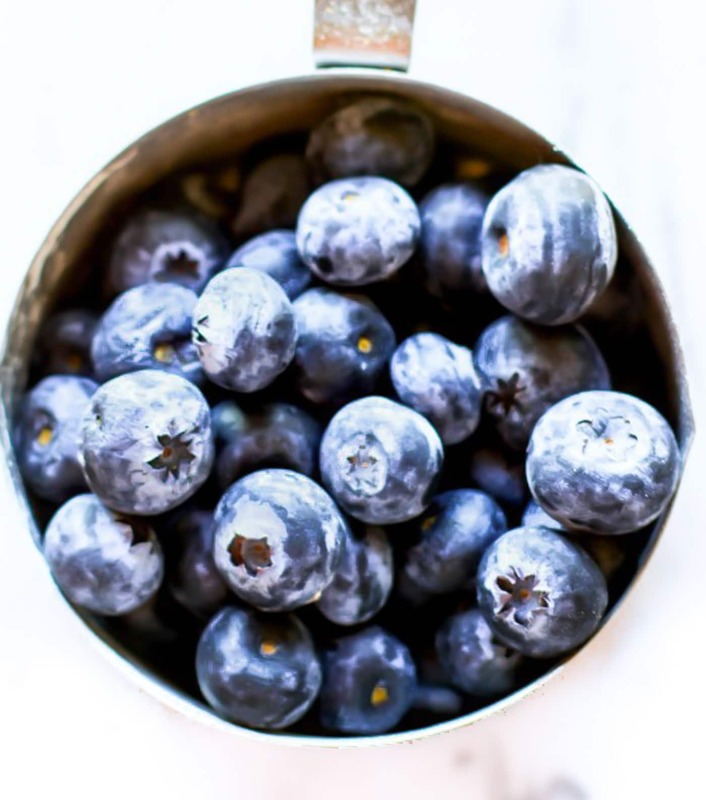 Diving into the whole superfood anti-inflammatory gut healthy recipe schpeel. Ya, remember the detox broccoli salad? Well, I kinda sorta just made it into a whole meal. Haha, trust me when I say “GOODNESS! !” This the only way to eat chicken salad. It’s lighter, it’s freshers, it’s better for you gut, it’s loaded with extra superfood ingredients. Oh and it makes for one stellar meal prep bowl. Can you even deal? One fact you may or may not know about me. I am not too keen on chicken salad. Unless I make it my way. 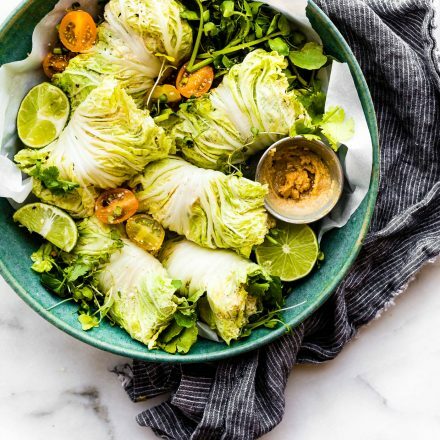 With all the flavors or wrapped up in something delish, like mango and miso and cabbage oh MY! Truth be told, I don’t even like turkey unless I make it my way.CHOW FUN! Maybe I’m high maintenance? LOL, don’t answer that. But really, I get so nauseous around chicken salad. Is that weird or what? Yep, it’s true. And I will probably be disowned from my family for saying I don’t like chicken salad, but I”m willing to chance that on the sake of taste and a settled stomach. Haha! Today I am sharing my way (the only way) to make Chicken Salad, with a zippy yogurt olive oil dressing instead of mayo. Yup, totally copying my detox broccoli salad obsession. But hey, it’s good detox, remember? Filled with nourishment! 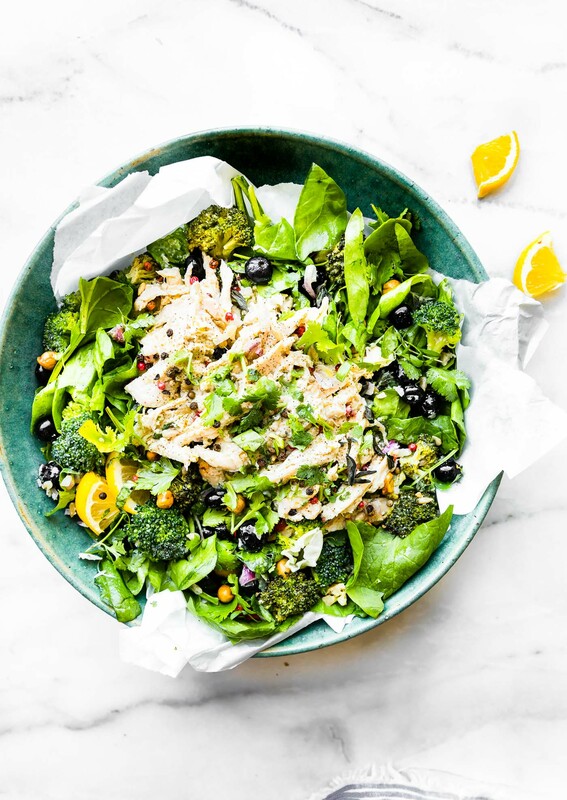 You see, this superfood chicken salad bowl will not only make you fall in love with chicken salad, but it will nourish, replenish, and rejuvenate your foodie soul with REAL food, prebiotic and probiotic rich food. Can I expand on that for a second? Please just nod yes and follow me here. 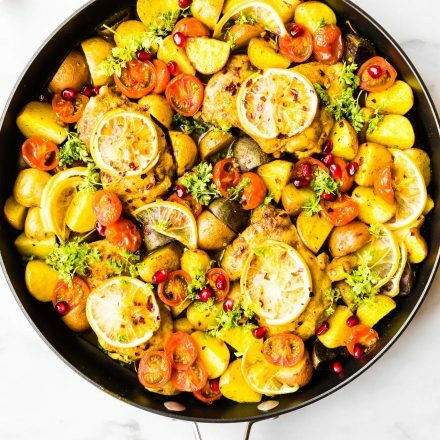 Free Range Roasted chicken – Essential amino acids and protein! I like to add some of the skin to the salad for flavor. You can reduce the oil content in the detox salad to balance out the fat content. Either way, both are healthy fats that the mind and body will soak up and utilize! Detox Broccoli Salad – Roasted and raw broccoli, spinach, blueberries, sunflower seeds, and a tangy yogurt olive oil sauce. Except we’re going to double that yogurt sauce coat the chicken! –> Plant based Iron, phytonutrients, probiotics, Vitamin K, Vitamin C, fiber! 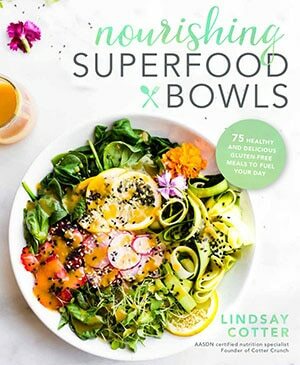 You can’t get more SUPERFOOD than that ya’ll! Cilantro or Parsley – both are detoxifying herbs filled with vitamin C, beta-carotene, chlorophyll, vitamin K, and b vitamins like folate. Peppercorns (red and black) and Red Pepper Flakes. Dried Goji berries to top – Provide High Levels of Antioxidants and Anti-inflammatory Nutrients. Plus a burst of sweetness. 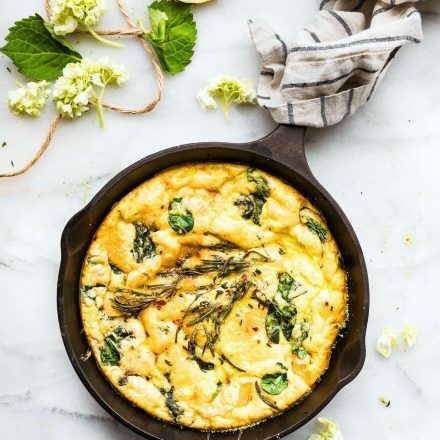 Extra virgin olive oil to drizzle – High in monounsaturated fats and Vitamin E. Helps you absorb all those other fat soluble vitamins. YEA BABY! 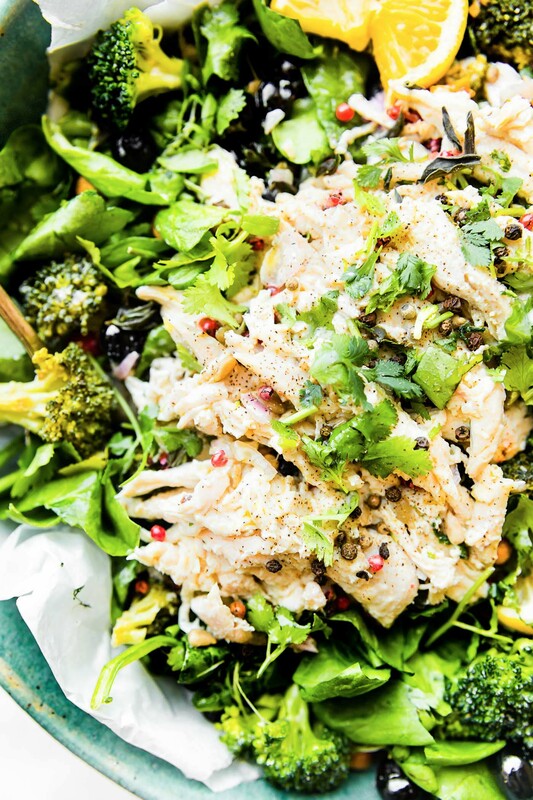 A lightened up Mayo Free Chicken Salad! 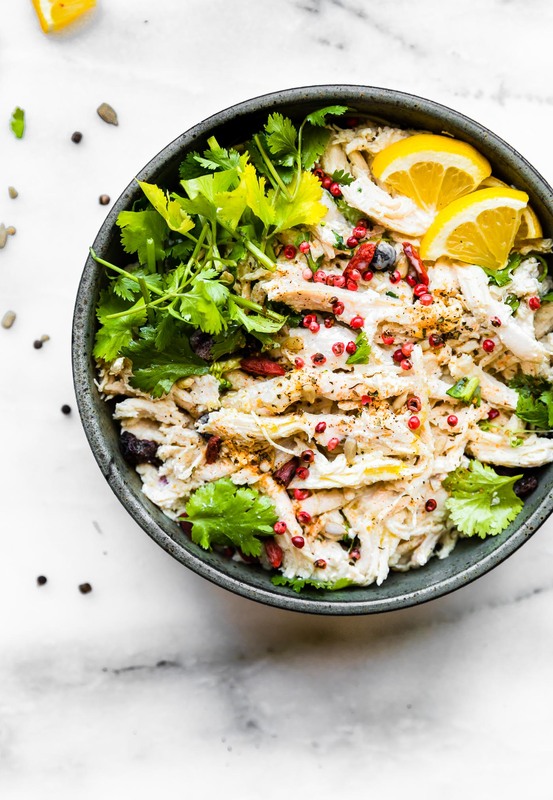 A chicken salad bowl that’s perfect for a healthy meal or side dish. 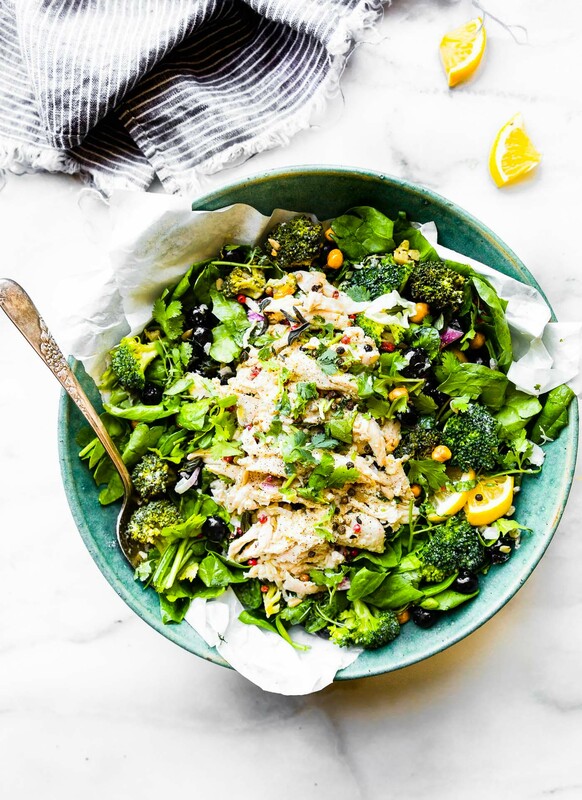 Spinach, roasted broccoli, berries, chickpeas, roasted chicken, and herbs tossed in a light yogurt olive oil dressing. Peppercorns or fresh pepper and optional red pepper flakes. 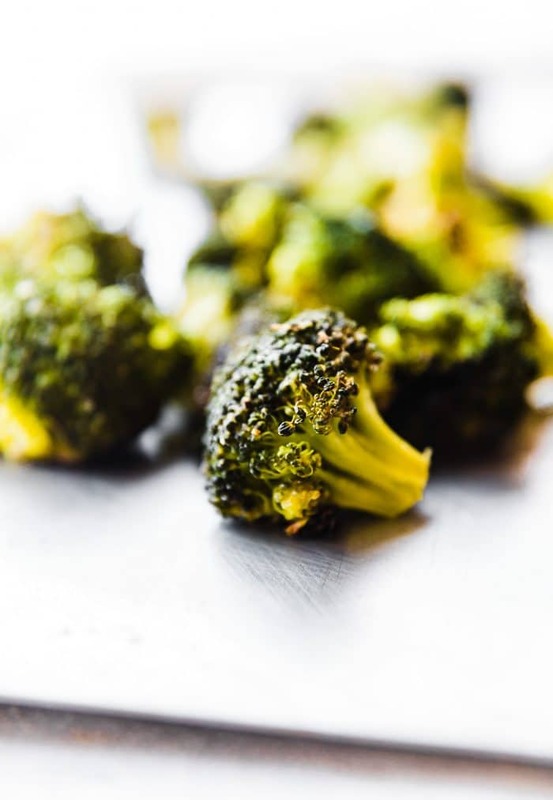 Optional method – Roast 1/2 lb of broccoli in oil for extra flavor. Preheat oven to 425F. Toss half the broccoli florets (around 2 cups) in 2-3 tsp oil and seasoning of choice. Place on baking sheet and place in oven to roast for 20-25 minutes. Place the other 1/2 lbs broccoli florets in a large mixing bowl. If you don’t want to roast half, just toss all raw broccoli florets in a large bowl. While broccoli is cooking, make your yogurt sauce for the chicken salad. Mix the yogurt, vinegar, garlic, salt/pepper, olive oil, lemon juice, and onion in a small bowl. Set aside. Next spoon 1/2 cup to 2/3 c yogurt sauce over the chicken and toss all together. Save extra yogurt sauce for bowl. Layer your spinach leaves at the bottom of a large bowl. Place your roasted broccoli and/or raw broccoli, blueberries, sunflower seeds, and chickpeas on top. Toss all together with the remaining yogurt sauce (dressing) you have. 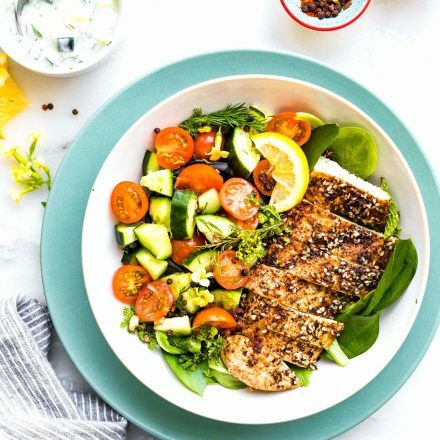 Finally, add your chicken salad on top of the salad bowl. Garnish with goji berries, herbs, lemon slices, and peppercorns (if desired). Serve or store in fridge for later., covered. Chicken salad can be made ahead of time and stored in airtight container for up to 5 days. Great for meal prep! Chicken salad can be made ahead of time and stored in airtight container for up to 5 days. Great for meal prep! If making ahead of time, keep salad and chicken salad separate until ready to eat. If you are using greek yogurt, the mixture will be thicker. Thin it out with more oil or a bit of broth/water (if desired). Well, what do you think? Have I convinced you to try yet another mayo free salad? Come on now, hug your gut and gut healthy. Let’s all grab a fork. Mmm k? 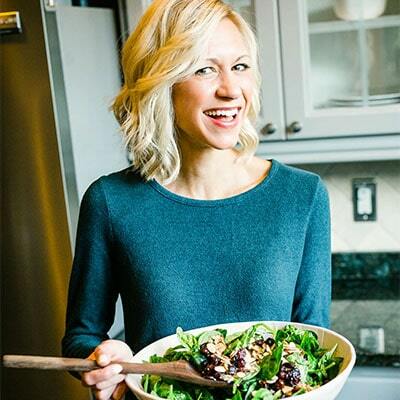 If you can convince me to try a chicken salad with mayo, I’ll send you a free cookbook! Ha! But in the meantime, I suggest you love your gut and give this chicken salad bowl with creamy yogurt dressing bowl a whirl. I’m so picky about my chicken salad but I love it when it is done right. Most of the time, it is made with too much mayo / dressing, but this is the perfect ratio! So delish on a salad or as a sandwich! Love that this uses Greek yogurt instead of mayo!! Much as I love mayo, there’s often way too much in chicken salad. Your yogurt dressing is a delicious alternative! I’m going to make this all summer long! Holy beautiful! Can’t wait to try this!! Exactly what I need for lunch tomorrow! Nice and light. I love a good chicken salad! And now… Now I want to make this one too! Gah! I want to make EVERYTHING you make. THANK YOU for feeding my inner hungryyyy person! use coconut kefir yogurt and you’re golden! I look out for you and your lack of gut. 😉 Mwah! I am not a fan of mayo – love this version! Plus all the delicious add ins, yum! Love this healthy meal. We are making it tonight because I have some leftover cooked chicken. 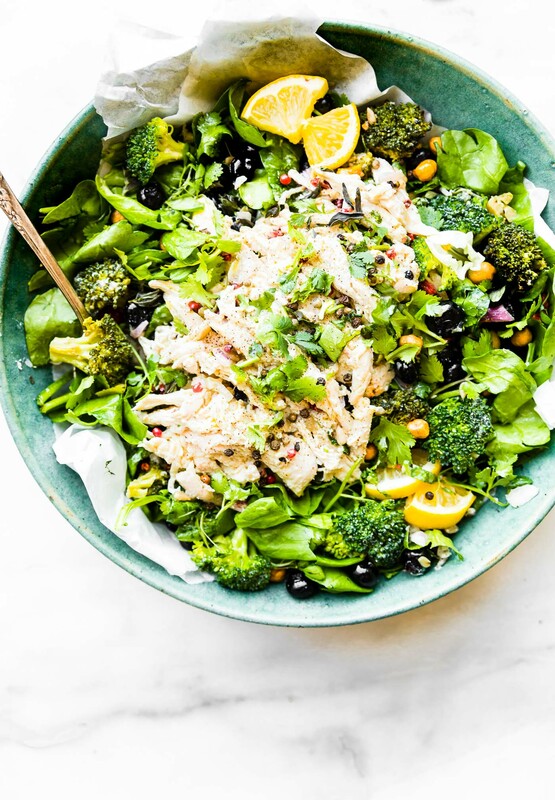 This chicken salad bowl is lunch goals! Lindsay this was the most delicious salad I have ever eaten!! I also made another version with canned tuna fish and it was as equally spectacular!! It’s a keeper! I pinned it to my Easy Recipes Pinterest board and printed the recipe for my collection!! Thanks so much for keeping my belly full!! Oh I am so glad Carol! I saw your tweet, looked awesome!